Make sure you know where every dollar is going with these helpful tips. College is a time to learn — and not just in the classroom. That applies to your bank account as well. You learn which habits to avoid (like overspending while shopping online, whoops) and you learn how to manage your money like an adult (like finally setting up direct deposit for your part-time gig). 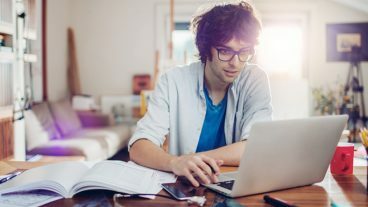 As you earn more, your finances may become more complex — especially once you graduate and start earning an income, take on a rent payment, or have to pay back student loans. Keep your bank account in mind with these tips and tools that can help you spend and save wisely. The first tip of monitoring your money is to utilize available tools. Look for a tool like Budget Watch where you can opt to create a spending plan from your existing Wells Fargo accounts. Using your account history, Budget Watch will suggest monthly goals for different expense categories (like transportation, shopping, travel, and more) or you can manually set goals. It may help to start with the suggestions, take a couple of weeks to see how they match up with your actual spending, and then fine-tune the numbers. Among the benefits of using a tracking system is that it makes it easy to see if one particular expense is really setting you back — maybe you realize 50% of your take-home pay goes to rent — and then you can think about how you can adjust (like by getting a roommate!). Some things you need in life, like that $30 copay for a monthly medication or a $20 tank of gas to get to work each week. But other things — entertainment, restaurant meals, and shopping — can be managed. After you’re in the swing of monitoring your budget, turn a critical eye toward those discretionary expenses and determine what you can trim. Take, for instance, your lunch. A Visa survey found that the average American spends $53 a week eating lunch out — $2,756 a year. 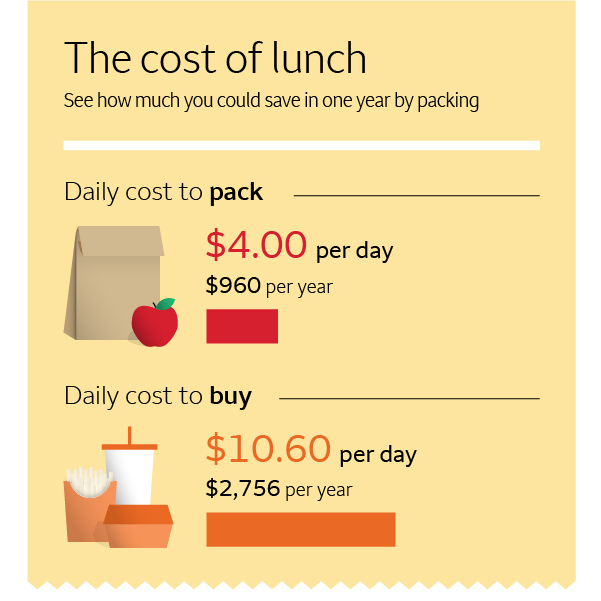 The average brown-bagged lunch costs $4 per day, or $80 per month. Over the course of a year, you could easily save more than $1,500 by packing your own lunch most of the time while still taking the occasional trip to your favorite haunt. Sure, $10 a month doesn’t seem so bad for streaming video service. But add that to the other monthly costs — $10 for streaming music, $100 for your spinning classes, $10 for your monthly beauty box — and suddenly half of your paycheck is gone. Do you have a Wells Fargo checking account? If so, you have access to Control TowerSM, which allows you to monitor which merchants you have recurring payments with. Take inventory of your subscriptions and make an honest assessment of whether you really need them. Keep your money where it belongs (in your bank account!). Using Wells Fargo tools can help you make bill payments on time and avoid fees, overspending, and overdrafts. For example, Wells Fargo Online Bill Pay is a way to schedule payments in advance of the due date or, even better, set up recurring autopay so you don’t have to think about scheduling payments each month. There’s a popular expression among financial pros to “pay yourself first.” This means automatically routing specified savings from each paycheck to a savings account — and once you’re working after graduation, into a retirement plan account, like a 401(k). If you can afford it, set a fixed amount to directly deposit into your savings account each month — say 5% or 10% of your take-home pay. Experts generally agree you should aim to have three to six months’ worth of expenses saved in an emergency fund. Payments back for it. You can easily request (and make payments to others) with Zelle®. Zelle is already part of the Wells Fargo Mobile® app and part of Wells Fargo Online, so there’s nothing to download. And unlike other payment apps where you need to set up a transfer, once you send money using Zelle, the money moves directly from your account to theirs, typically in minutes2. 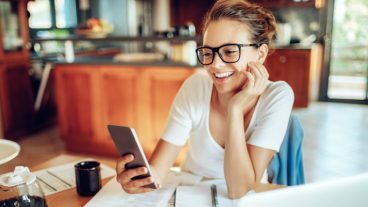 While monitoring your money isn’t exactly the most exciting topic, if you put the work into developing and sticking to a plan now, you’ll be developing good habits for life, kind of like taking a vitamin or brushing your teeth. Monitoring your money can pay off down the road in the form of good credit, a reliable emergency savings fund, and an ability to achieve future goals like owning a home. Monitor how your money moves with Control TowerSM. 1. Sign up may be required. Availability may be affected by your mobile carrier’s coverage area. Your mobile carrier’s message and data rates may apply. 2. Transactions typically occur in minutes when the recipient’s email address or U.S. mobile number is already enrolled with Zelle. However, some payments may take up to 2 business days. Available to almost anyone with a U.S.-based bank account. For your protection, Zelle should only be used for sending money to friends, family, or others you know and trust. Sending money through Zelle is similar to making a payment in cash. Your mobile carrier’s message and data rates may apply.